This smaller Kizer folding knife is sure to become one of your favorite everyday carry tools. 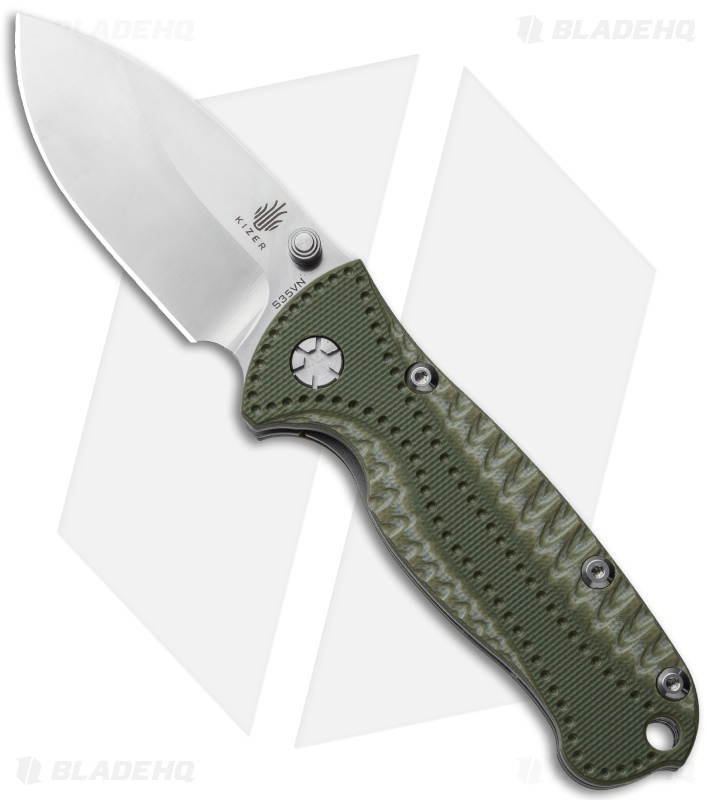 The curved handle, finger groove, and textured G-10 handle scales make this knife both comfortable and secure in your hand. The satin finished S35VN steel drop point blade can easily handle any of your daily cutting and slicing tasks. The blade opens smoothly using the ambidextrous thumb studs, and the liner lock mechanism holds it secure during even your most challenging jobs. 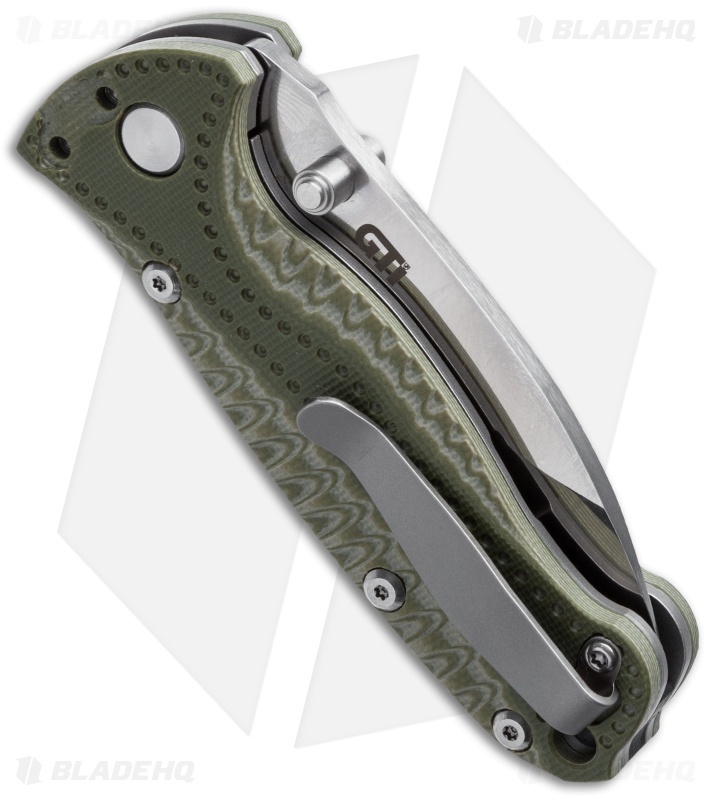 There is a right hand, tip-up titanium pocket clip for easy carry, and a lanyard hole in the handle end to give you additional carry options. I cant think of anything wrong with this knife. Its smaller and lighter than I expected but I love how it fits in your hand and everything else is perfect the centering is dead on and the blade came extremely sharp. No problems what so ever with detent. When I first got it flipping it open with the thumb studs was a little difficult but I put some oil on the pivot and now the blade flies out every time. I paid $82 for this knife but I've seen it on kizers site for as low as $52 all in all I still think it was very much worth the original price. Once you pick this knife up you can tell it's very high quality. I highly recommend this knife to anyone thinking about buying it. Got this knife at a GREAT price on sale and so glad I did. Very nice knife. Fit and finish is great, great steel and I love the look of the scales. Blade has a thick spine but came VERY sharp. Action was a little stiff at first but has broken in nicely and is smooth. Carries pretty well, is slightly thicker than my other edc knives but only just a little. Like the blade shape and works well for my daily chores. Would buy a few more if I could at the same price. #2 edc knife behind my GiantMouse Iona. Picked this up for a great sale price. Extremely impressed and satisfied. The blade is gorgeous and comes sharp out the box. The G-10 feels great and the action is silky smooth. I've been flipping the blade open constantly, just so smooth and easy! It's a great size, carries pretty deep in pocket, and weight for my daily use in the office.Not intimidating like big knives but it feels solid like it can do some heavy work if needed. You won't be disappointed, pick this knife up! Great packaging and quality. I was very impressed how sharp and well built it was out of the box. It has now become my favorite EDC. A little hard to open in the beginning, now it is butter smooth. The first thing you notice with this knife is the weight. It's not heavy, but for its size it has some heft, which is nice. It makes the knife feel solid and over built. The knife was a bit stiff at first, but after a week of use it's silky smooth. The ergonomics of the knife are not bad, however, they are not great either. I contribute this to the small size of the knife, and honestly for what I use the knife for its fine. The blade shape is so broad that it doesn't lend well to open envelopes, but it is a great slicer. They knife came super sharp and has stayed sharp after a week of moderate use. Overall, this is a great gentlemans folder. It's beefy, but small enough not to offend those around you when in use. The knife design is unique and unconventional, which adds to its enjoyment. Great knife! Who knew China could make a knife with exceptional quality. There's a 3.5" version of this knife that I found to be too big to carry around with me. In this size and weight, however, it is a keeper in my EDC rotation. Great ergonomics, deep carry clip, beautiful mirror finish, sharp out of the box. This knife still uses the old pivot screw, as opposed to the new one in the Matt Cucchiara collabs, which is a bit disappointing. It's also a smaller screw as opposed to other Kizer designs, so the center of the screw's milling isn't polished. It should be noted that, unlike the 3.5" blade version, the liners of this knife are not anodized.